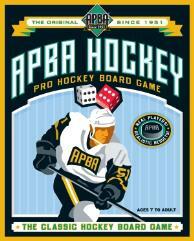 Satisfy your hockey APBAtite with APBA Pro Hockey! For well over 50 years APBA has been the unchallenged KING of quality sports entertainment products! Now with APBA Hockey you can get in on the excitement. Fun, quick and easy to play, APBA Hockey puts you right in the middle of the action. APBA Hockey comes with 44 classic real player cards to choose from. These players make up two of hockey's great championship teams. These legendary teams will allow you to enjoy the thrill of hockey, the way it was meant to be. APBA Hockey is a great game to enjoy some quick hockey fun or to learn its unique strategy. Oh-did we mention that APBA Hockey is as realistic as the pro's, and is statistically accurate? We've even upgraded the results boards, so it's even MORE ACCURATE than ever before. APBA Hockey is so easy to play that you'll be rolling dice and playing within just a few minutes! Our easy to read instructions will have you gliding across the frozen pond and shooting toward the net in no time. After you become familiar with the basic rules, it's up to you to start incorporating APBA Hockey's optional rules, which give you all kinds of coaching flexibility. With APBA you're the coach. You set the lines. You set the situations. You make the calls that put your team in position to win! So what are you waiting for? Get off the bench and get on the ice!